Native plants are flourishing unexpected at old abandoned gold mines in Southern New Zealand in spite of the fact that no landscape remediation was done. While natural reclamation through mine abandonment has historically been the default management strategy for mining sites around the world, the strict environmental policy of today typically mandates extensive site engineering after operations cease. Turning mine sites into usable land for agriculture, forestry, or recreation often entails time-consuming and costly rehabilitation measures such as topsoil replacement and replanting. Water management directs these approaches in arid climates because mine water evaporation as a product of unique geologic settings produces often undesirably saline soils. However, the salty soil of historic gold mine sites in the South Otago region provide rare naturally occurring saline habitats that are elsewhere jeopardized by expanded farming and new agricultural processes. Druzbicka et al. 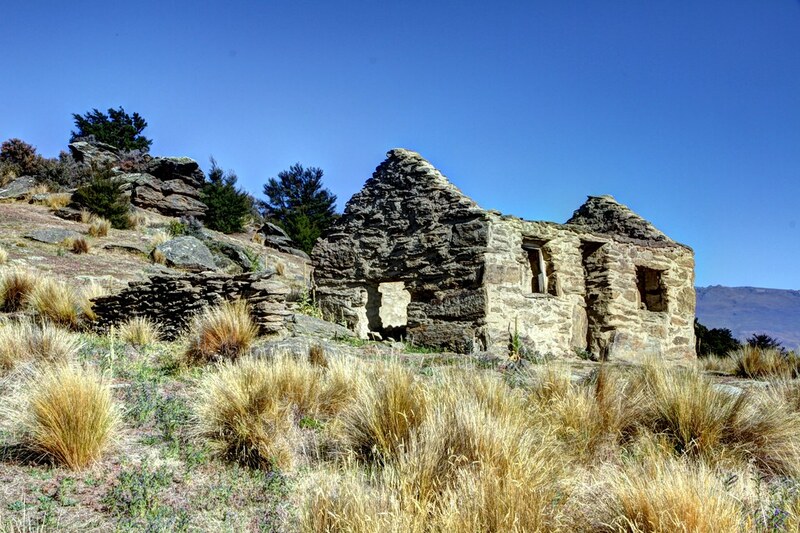 (2015), a team of geologists from Otago, New Zealand, suggest that limiting anthropogenic site engineering and encouraging natural rehabilitation can promote ecologic habitats. The arid southern reaches of the South Island of New Zealand make direct measurement of mine water composition impossible due to rapid evaporation. The authors instead develop reconstructed mine water compositions for multiple abandoned sites in a gold mining district to characterize the geologic constraints on the evaporative process. Salt encrustations up to centimeters thick are found atop low sloping erosion exposures from streambed mining techniques. These surfaces consist of mine tailings atop a weathered, clay-rich layer of the underlying geologic formation. This gently sloping substrate that prevents rainwater from becoming runoff or percolating downward is an ideal environment for saline leachate to develop. These deposits most closely resemble the chemistry of seawater indicating that the uniquely salty deposits are primarily sourced from marine aerosols deposited through rainfall though the composition of salts also has chemical links to groundwater as well as source rock. These now defunct gold mines provide a nearly hundred-year-old natural laboratory for evaluating native revegetation. Cross-comparison of these salty soils to the distribution of salt-tolerant endemic flora shows that these sites establish delicate ecosystems that are increasingly threatened locally. Not actively restoring these mined landscapes has allowed long-term natural regeneration of well-suited flora and is protecting regional biodiversity. Indeed, both study sites are now protected as natural preserves. While the model put forth by Druzbicka et al. is confined to similar sites in semi-arid climates, there may be applicability within the similar geologic settings of many coal mines, including those in Australia and the United States. While undesirable aspects of old mines including slope instability, dust production, and unsightly barren appearance must be mitigated with site management, a growing perspective suggests that lack of environmental intervention need not compromise long-term biodiversity. Druzbicka, J., Rufaut, C., Craw, D., 2015. Evaporative Mine Water Controls on Natural Revegetation of Placer Gold Mines, Southern New Zealand. Mine Water and the Environment, 34, 375-387. This entry was posted in Ecological Restoration, Zoe Dilles and tagged biodiversity, Ecology, Geology, Gold Mine, Joanna Druzbicka, Land Restoration, Mine Reclamation, Placer Mining, Water Management by Emil Morhardt. Bookmark the permalink.